← Yesterday was a busy day. Home » A second life in pictures » So very small and unformed. So very small and unformed. That’s how I feel. Like the smallest of the smallest things, smaller even than the Demi-fae; they at least know who and what they are. And blurry, as if I’m not fully formed, which I suppose I’m not. My caretakers in London had friends who used to laugh and say, when things got rough, ‘Don’t worry, it’s only a movie.’ They were crazy and American and visited us every so often over the years. I wonder if I could get by with just deciding this is only a book. I’m just illustrating it. 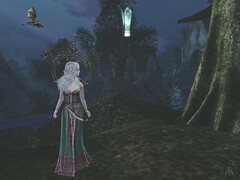 This entry was posted in A second life in pictures, Roleplaying, Uncategorized. Bookmark the permalink.